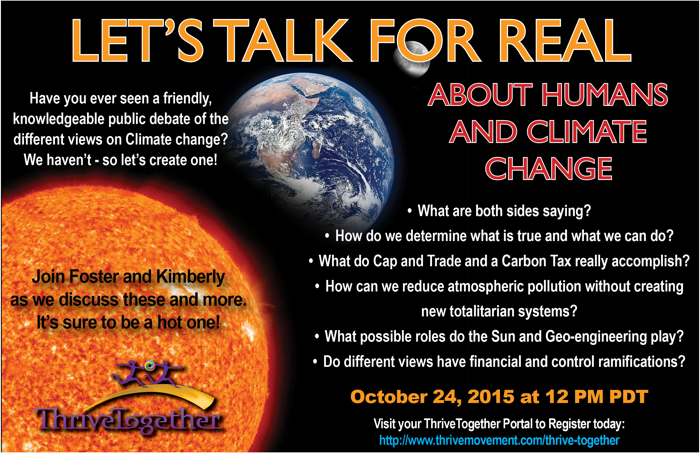 Have you ever seen a friendly, knowledgeable, public debate of different views on the climate issue? We haven’t. So let’s create one! Join Foster and Kimberly for this online think tank and bring your data, perspective, concerns and an open mind, so at least we at ThriveTogether can have a useful exploration — with time, mutual respect and a shared mission of learning from one another, discovering more truth, and identifying effective paths of action. Why is there no live, televised public debate about global warming/climate change/climate collapse? If the planet were warming and continued to, even after reducing atmospheric carbon below 350ppm, what would we do then? Is there planning going on for the future of coastal communities? And where is that discussion being had? What incentive would someone have for explicitly discouraging IPCC researchers from mentioning the role of the sun in warming the Earth? If CO2 is the cause of global warming, what is to be made of the evidence that temperature changes lead, rather than follow, changes in CO2? Have temperature fluctuations happened before? Did they happen before humans were using fossil fuels? Specifically, what is the history of the Medieval Warming Period and why is it such a taboo subject? Are there unspoken financial incentives for some people from both sides of the issue to promote their perspective?